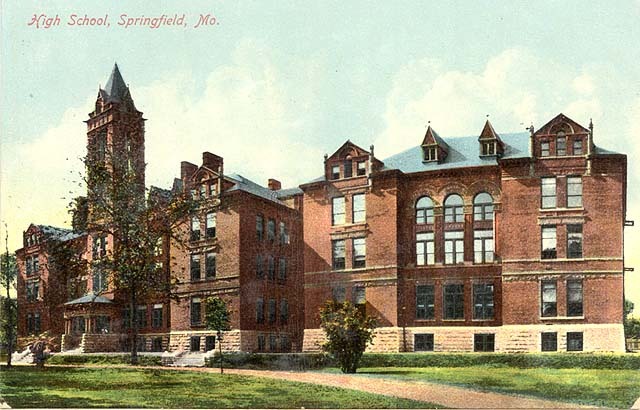 Springfield High School was built at the northeast corner of Jefferson Avenue and Center (later Central) Street in 1893. Springfield's first high school was established in 1867. For the first few years students attended classes in borrowed facilities. In 1870-71 the Central School was built at what is presently the corner of Jefferson and Olive. It housed grades 1 through 12, with high school students occupying the top floor. 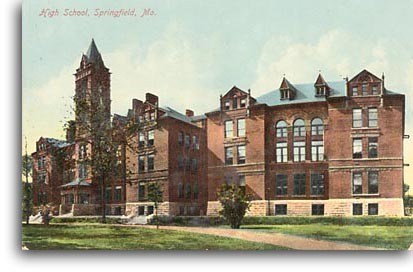 The school quickly outgrew the building and in 1893 a new high school called Springfield High School, or Senior High School, was built. The old Central School was sold to the Frisco Railroad, who later razed the building and built the Frisco Building, now called the Landmark Building. In January 1894 the new Senior High School was opened. It had 44 rooms, including an auditorium on the second floor. During the first year, the school had two graduating seniors and 76 students. The site of Springfield's first high school was originally occupied by the physician E.T. Robberson. It was purchased for $15,000 and the building cost another $65,000 to build. Jonathan Fairbanks was superintendent of schools from 1875 until 1913 so he oversaw the beginning of the new high school. The first school yearbook was created in 1902 and it was called The Exodus. In 1904 the name was changed to The Windup and since 1907 the school's annual has been called The Resume. The student newspaper, called The High Times, began publication in 1913 and is still published in non-regular editions. The student body of the high school grew steadily in the years when Springfield had only one high school and several additions were made. In 1907 the center section of the present building was completed, which added 11 rooms. The postcard shows the high school sometime between 1907, when this addition was made, and 1909, when the card was postmarked. In 1913 the east section was built, increasing the building's capacity by 21 more rooms. The boiler room was added in 1914 and in 1916 the manual training building was completed. In 1931 a larger gymnasium was constructed behind the west section of the main building. It was commonly referred to as "The Pit" because the floor was about seven feet lower than the bleachers. In 1936 Harrison Stadium and the south fieldhouse were built at the corner of Summit Avenue and Central Street. In 1937 the fine arts building on Benton Avenue behind the east section of the main building was added. It contained 4 rooms, the studio theater, the main study hall and the music department. In 1939 the industrial arts building just north of the fine arts building added 11 more rooms to the high school. In 1940 a new upstairs auditorium was added, as well as a cafeteria on the first floor. This marked the end of most construction on the building, with a fireproof stairwell added in 1960 and a new physical education facility behind the main building added in 1982. Enrollment at Springfield High School was at its highest in 1955-56 when 3,491 students were enrolled. The following year, 1956-57, Parkview High School was built and Springfield High School's name was changed to Central High School. From 1884 until 1954 black students in Springfield attended Lincoln High School. In 1954 the public schools in Springfield were integrated and Lincoln High School was closed. According to newspaper articles, the transition was smooth. Interestingly, Linda Brown, whose father was the litigant in the famous civil rights case "Brown vs. The Topeka Board of Education," graduated from Central High School in 1961. In 2000 a plaque honoring Linda Brown was placed outside of Central High School. In 1922 the first all-female drum corps in the United States was formed by R. Ritchie Robertson. Originally called the Scotch Lassies, the Kilties have been performing with bugles, drums and bagpipes ever since. Central High was nearly closed down twice, in 1982 and 1995, but the school board decided to renovate the building rather than tear it down and build a new one. In 2000 a program called the IB or International Baccalaureate program celebrated its first graduating class. The IB program is a 2-year liberal arts curriculum for highly motivated and academically advanced students in grades 11 and 12. Candidates for the program must complete advanced courses in English, a foreign language, history, science and mathematics. This prepares them for entrance into excellent colleges and universities throughout the world.